(05-01-08) - Much has been written about the Roswell Incident of July, 1947 over the past 60 years, and while some researchers have written it off as a crashed balloon with crash test dummies, some of us continue to look for other explanations of what really happened, not believing the four excuses given by the military during those 60 years. New witnesses and information continues to be found about the Incident and that appears to be worth investigating, to determine what actually happened. The annual celebration of the Roswell Incident each July since 1995 has attracted many visitors to this southeast New Mexico town generating revenue for the city of Roswell, and exposing the incident to the world with the media coverage it has received. Many however, view the annual Roswell event as a carnival rather than as a serious study of what happened here 60 years ago, even though some well known researchers are usually present each year to share their research. When the city of Roswell took over the annual event last year, the attendance figures once again increased compared to the previous few years when the UFO Museum was in charge of the Festival. It was the city’s desire to make the annual celebration a family event. The UFO Museum and city were not been able to work together, thus 2 separate events were held during last years Festival, and it appears that it will be the same again this year for the upcoming July 2008 Roswell Festival. On the opposite end of the state near Farmington, New Mexico in the four-corners region of the state, another crash supposedly happened only 10 months after the Roswell Incident in March 1948, known as the Aztec Crash. The Aztec crash has also been riddled with skepticism and beliefs of it being a hoax, however in recent years much more information has come forward primarily through the research of Scott and Suzanne Ramsey, requiring a much closer look at that event. Other than the fact that both crashes occurred in New Mexico within 10 months of each other, there are many differences in the two events. 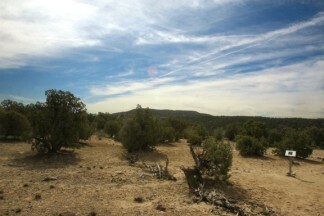 The Roswell craft was discovered in many small pieces scattered over the Foster Ranch, and was estimated to be about 30-40 feet in diameter, while the Aztec craft appeared to make a forced crash east of Aztec in Hart Canyon with slight damage, and measured about 99 feet in diameter. Roswell’s craft supposedly had 3-5 bodies, while Aztec’s had 13. Both crafts are believed to have been recovered by the military with Roswell using the 509th bomb wing from the Roswell Army Airfield, and the Aztec crash being recovered by a military unit from Colorado. Columnist Frank Scully wrote about the Aztec crash in his book “Behind the Flying Saucers” published around 1950. 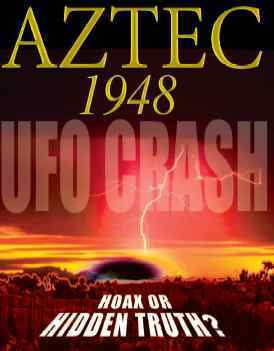 In 1986 William Steinman and Wendell Stevens published “The UFO Crash at Aztec”. Similar to the descriptions of the “metal” in the Roswell craft, the Aztec craft “metal” could also not be burned, cut or damaged when attempted. Neither craft showed any signs of rivets, bolts, screws or signs of welding. After 60 years no physical traces have been discovered at the Roswell crash site yet, while the Aztec site has a road leading to the site that wasn’t shown on older maps, and a small concrete slab exists that could have possibly been used as a support for a crane outrigger. It has been established that the concrete slab is not a well cap and no other reason for its existence at the crash site exists. Although I had read both of the books mentioned, I too didn’t put much confidence in the account of the Aztec crash for several years, until the Friends of the Aztec Public Library decided to conduct an annual symposium starting in 1997 to celebrate the 1948 crash, and to help generate interest in obtaining a new library for Aztec. 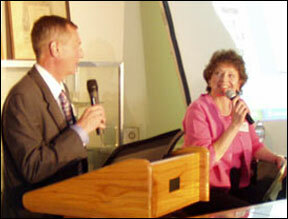 (That goal was accomplished a few years ago with the dedication of a new state-of-the art library in Aztec.) There are not enough words to be said about the many volunteers who have diligently worked at accomplishing this over the years, for the benefit of the library and the city of Aztec, not to mention the UFO enthusiasts who attend each year. A few of the volunteers that have been actively involved all these years include, Scott and Suzanne Ramsey, Katee McClure, Donna Chadwick, Randy and Suzanne Barnes, to mention only a few. I was involved with the Roswell Festival as a speaker on several occasions during the past 11 years, but consider myself extremely fortunate to have been involved with Aztec’s symposium every year for the past 11 years as a speaker or Master of Ceremonies. 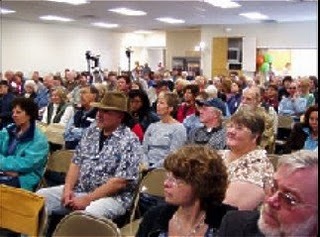 The annual Aztec symposium had a few speakers during the early years that were less than credible, and they have decided to be more cautious about who is invited to speak at the annual event, thus providing a symposium for those interested in serious UFO research, without any of the carnival or “woo-woo”atmosphere. The recently held Aztec Symposium in March 2008 was a good example of the type researchers Aztec is attracting, and the increased crowd attendance verified the importance and interest of those attending. As emcee this year I had the honor of introducing; Stanton Friedman, Mike Forston, Duane Tudahl, Ron Storch, Timothy Good, Ted Phillips, Scott and Suzanne Ramsey, and Dr. Jesse Marcel, Jr.
One problem that the Aztec symposium is encountering is the fact that a facility is needed to accommodate the ever-increasing crowds. The annual symposium has been held in various locations within the city of Aztec and again this past March a sold-out crowd was present. Not a bad problem to have. Be on the lookout for a new book by Scott Ramsey shortly that will be the most comprehensive account of the Aztec crash to date. Doing research on the Aztec crash, Scott has traveled to 31 states, interviewed over 73 first and second-hand witnesses, and archived over 3476 Atomic Energy Commission, United States Air Force, F.B.I. and C.I.A. documents. He has also uncovered three secret radar bases, with possible connections to the Aztec crash. The Aztec crash like the Roswell crash back in the late 1940’s are both cases that will require further research to finally determine the truth, since we obviously have not been given that truth for over 60 years.